In today’s episode of Exonews TV, William Tompkins reveals an astonishing secret acquired by U.S. Navy spies embedded within Nazi Germanys advanced technology projects during the World War II – the Nazi war effort was being assisted by extraterrestrial visitors. They had, if you want to call them, consultants, who are Reptilian consultants assisting on all of these different things that it takes to design and build these spacecraft carriers, and propulsion systems. So this is an extremely well developed program and documented like crazy. Getting copies of the documents was hard for them, hard for our spies. This was an open program in the upper level of the SS.
. These young kids, the operatives, they couldnt believe half of what they brought back, what was going on. But some of them were really good people, and they knew how to get into places and listen to whats going on, and finding what that guy he had talked to, or he heard, and going to so and so, because yes they were doing that over there. We cannot take credit for our record advancement in certain scientific fields alone. We have been helped.” When asked by whom, he replied, “the peoples of other worlds. When Vril was building that first craft, the Vril had one or two of the aliens that worked with them in Germany where they fired rockets from Peenemunde. The documents I read in Washington said thats where the first Vril vehicle was made…. They [aliens] were helpers to Germany. More recently, Secret Space Program whistleblower, Corey Goode says that from 1987 to 2007, he read intelligence briefings on smart-glass pads that detailed what had happed during World War II. He describes how German Secret Societies were helped before and throughout World War II by Draconian extraterrestrials who were assisting the former in the development of advanced antigravity space battle fleets. At the same time these [German Secret] Societies had made contact with the Draco Federation and another group that avoided the Dracos. The German Occultists were very busy from the early 1900s, especially the time just before, during and after World War One. Their major breakthroughs occurred in the late 1930s. Goode said that the ultimate goal of the Reptilians, in helping German Secret Societies and the Nazi SS, was to create advanced space carrier groups that would be capable of interplanetary conquest. The eventual German/Nazi space battle groups became what Goode described as the Dark Fleet. It operates outside of our solar system, and is described at length in the book, Insiders Reveal Secret Space Programs and Extraterrestrial Alliances. Consequently, the whistleblower testimonies by the CIA Agent and Corey Goode support Tompkins claims that intelligence briefing files dating from World War II did indeed refer to Nazi Germany being assisted by extraterrestrials. Significantly, the ultimate goal of the German Reptilian alliance went far beyond planetary conquest, as Tompkins claimed the U.S. Navy had learned from its spies. In addition to the preceding whistleblower testimony, there are important documents that support Tompkins extraordinary claims. In his autobiography, Selected by Extraterrestrials, Tompkins supplied a number of significant documents. 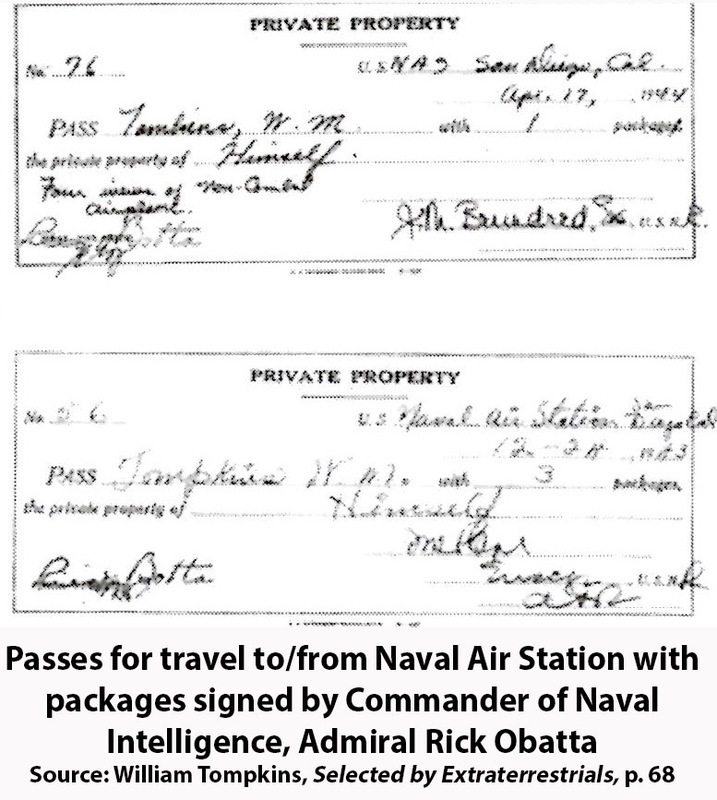 The two most pertinent to his specific claims that Navy spies were reporting on advanced Nazi aerospace projects, are Tompkins mission orders and two passes he received to enter and leave Naval Air Station with multiple information packages. His mission orders confirm that he was authorized to work as a Disseminator of Aircraft Research and Information. This is compelling documentary evidence that the packages Tompkins was carrying contained classified Naval intelligence on advanced aircraft designs, which included those developed in Nazi Germany. In last weeks ExoNews TV interview, Tompkins revealed how he participated in the debriefings of Navy spies, who returned periodically from Germany to give updates on what they were seeing in advanced technology projects. Tompkins job was to then design briefing packets that he would disseminate to leading U.S. corporations, think tanks and universities that could properly study and evaluate the information. Over the four years of his covert Naval Intelligence service (1942-1946) Tompkins estimates giving 1200 briefings at different locations, where he revealed Nazi secrets to those U.S. scientists most capable of understanding what the Germans were secretly developing. This weeks episode of ExoNews TV is likely to be deeply disturbing to those believing the question of extraterrestrial life is still largely a speculative question, arising from thousands of sightings of UFOs. Tompkins information sheds considerable light on probably the most closely guarded secret in the entire history of the U.S. Intelligence Community. Nazi Germany had been secretly helped by a race of Reptilian extraterrestrials prior to, during and after the Second World War! The U.S. Navy was to subsequently play the lead role in developing a strategic response to this threatening alien alliance, which would continue long after official military hostilities had ceased in Europe. © Michael E. Salla, Ph.D.
Did US Navy battle UFOs protecting Nazi Antarctic sanctuary in 1947?